This one doesn't look half bad! I'll stop short of saying that it looks "good," but they're certainly selling something like an improvement on the first three: At least from what's glimpsed in the trailer, Michael Bay seems to still be favoring broad-scope, fixed (or semi-fixed) shot compositions like in Pain & Gain as opposed to the unwatchable frenetic shooting from Revenge of The Fallen - I still wonder if I and others were correct that the technical challenges of shooting with 3D cameras has improved his technique? That wide shot of the villain (Galvatron, I'm assuming) emerging from the smoke with the big warship behind him? Stunning. There's no trace of bad comedy... though that will almost certainly change, and while the much-ballyhooed overhauls of the robot designs aren't quite as extreme a departure from the previous films as I'd hoped I can't deny that they look better. Finally, let's just face it: Even without the automatic brownie points he gets just for not being Shia LaBeouf, Mark Wahlberg, the actor whose ability to exist in the forms of Tough-Guy Hero and Adult Child simultaneously borders on the supernatural, is remarkably perfect casting for a giant-scale ultra-macho action movie based on toy trucks that are also toy robots. I mean, there's a scene in here where Wahlberg's character, Cade Yeager (CADE!!! YEAGER!!!! ), is working alone on a broken-down truck - which he does not yet know is actually a dormant Optimus Prime - and talks to it with the same basic inflection and emotion you'd expect from an animal doctor giving a checkup to the world's most nervous Saint Bernard. On discovering that this is indeed Prime, he delivers the line "...I think we just found a Transformer!!!" in such a way that the emotional subtext sounds less like "Oh! It's one of those alien robots!" than it does "Aw, man! I had one a' these when I was a kid, yo! Transformers were SICK!" and I kind of love that. 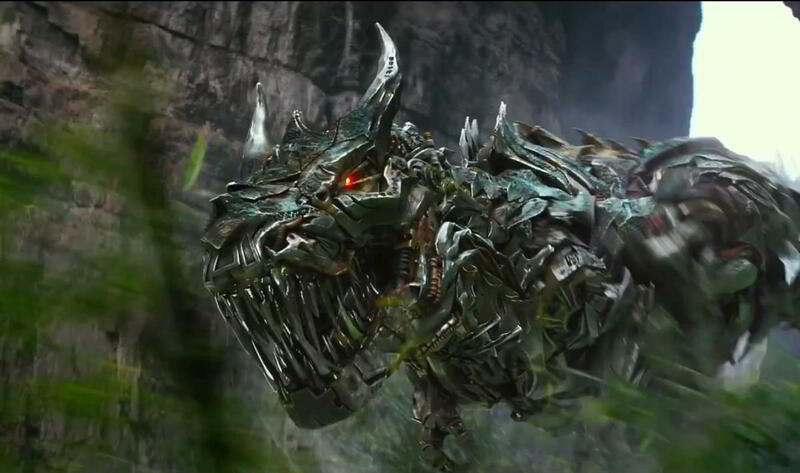 Also there are GIANT ROBOT DINOSAURS, which means that this movie is incapable of not being just a little bit good. That's just science. What happened to the Transformers? When Cade Yeager (CADE!!! YEAGER!!!!) 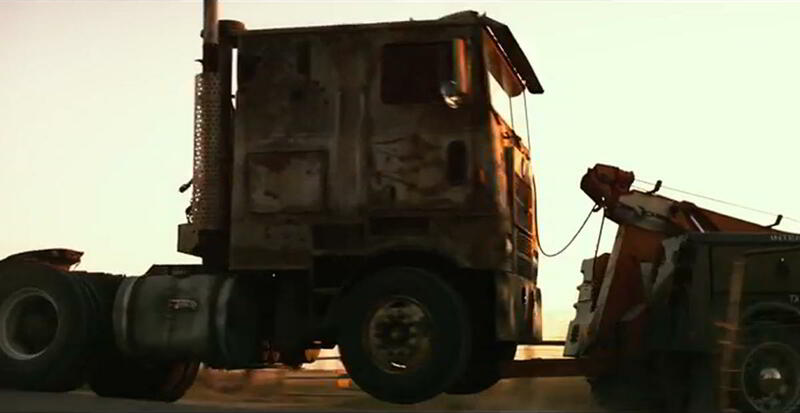 finds Optimus Prime, he's dormant in the form of a rusted-out 1980s-style truck (reminiscent of his original toy/cartoon form, cute) that looks to have been shot to pieces with high-caliber rounds. A billboard glimpsed earlier reads "Remember Chicago," and entreats us to "Report Alien Activity" while offering a phone number which, when called IRL, directs to a viral marketing site TransformersAreDangerous.com. No sooner does Cade activate Prime than Government Agents show up to harass him about it, leading to a shootout. Kelsey Grammer, whose sinister bureaucrat Harold Attinger is supposedly our main human antagonist, grumbles that "The age of The Transformers... is over." as we see an Autobot(?) getting hunted down and blasted to bits by soldiers. The new Bumblebee transforms next to an unidentified red Transformer as a bespectacled Stanley Tucci smugly informs him "We don't need YOU anymore!" Available character bios list Tucci as Joshua (no last name) a designer who "wants to build his own robots." So, what we're meant to infer here is that someone decided to wipe out The Transformers after all that destruction from the previous films. If so, that's pretty interesting, especially if it means The Autobots and the U.S. Military are now enemies (or at least no longer friends.) The idea of "Joshua" and his robots (is that what the red guy with BumbleBee is?) also intrigues me: Were The Autobots actually wiped out to make way for human-built replacements who could be more directly controlled - perhaps as some kind of commentary on the replacement of human soldiers by Drone Warfare? That... actually sounds like something that Bay (whose fondness for members of the armed forces is well noted) actually would have strong opinions on. Would he choose to address it in a "Transformers" sequel? I... perversely kind of hope so. Who is the human hero? Wahlberg's Yeager (who, by the way, is supposed to be a "struggling inventor") is the human focus of this first trailer in a "Look! Mark Wahlberg is in our movie!" way, but it's not 100% clear that he's the actual star. Yeager has a teenaged daughter (Nicola Peltz) whose boyfriend (Jack Reynor) is a race car driver named Shane Dyson (these NAMES!!!) - are we being faked out by the focus on Wahlberg, when in reality we're just going to get another interminable teenage romance?